During the week when I work, I always plan my meals the night before and make a point of cooking meals that can be done in less than 45 minutes. To achieve this, I rely a lot on my freezer for pre prepared frozen vegetables, herbs and spices and some pre prepared home cooked meals. New freezing methods used nowadays ensure that the full nutritional value of the vegetables and their freshness is retained fully so that I can reach out to my freezer at anytime and can be assured that the vegetables we consume are at their best. I am a big fan of freezing vegetables when they are in season so I have use of them all the year around. 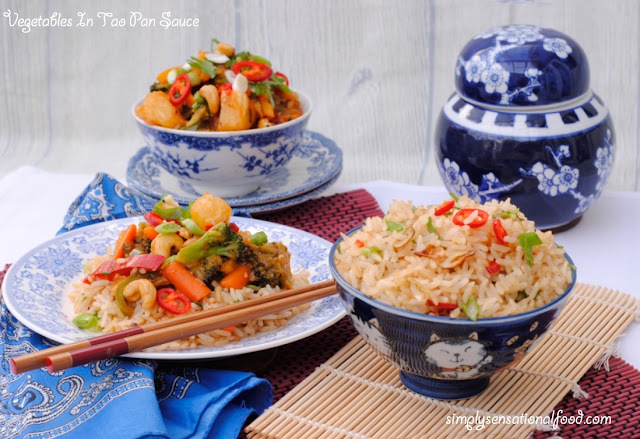 This delicious Garlic Rice and Vegetables in Tao Pan sauce with cashew nuts is one of my family's most favorite meals and I can have it from wok to table in less than 45 minutes. A medley of vegetables cooked in a sweet and sour Tao Pan sauce with cashew nuts served with aromatic Garlic Rice. 1. Chop the broccoli and cauliflower florets into smaller pieces.2. 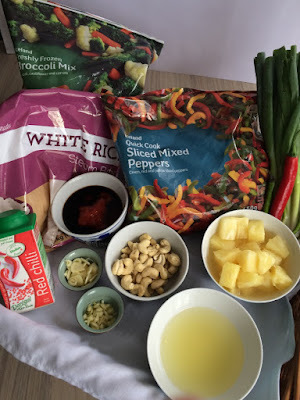 In a wok add the oil, when the oil is hot add the cashew nuts and fry them until they are golden brown, remove them from the oil and drain them onto kitchen paper.3. To the remaining oil, add the garlic and spring onions followed by the peppers, broccoli, cauliflower, red chilli and carrots and stir fry the vegetables on high heat for 3-4 minutes until they are cooked through.4. In a jug add the pineapple juice and corn flour and whisk together. To this mixture add the salt, garlic chilli sauce, tomato ketchup, soya sauce, fresh ginger, red chilli flakes and whisk together again. Add this sauce to the vegetables in the wok and stir fry until all the vegetables are fully coated with the sweet and sour sauce.5. Toss in the pineapple chunks and the fried cashew nuts. Transfer the Tao pan vegetables from the wok into a serving bowl. 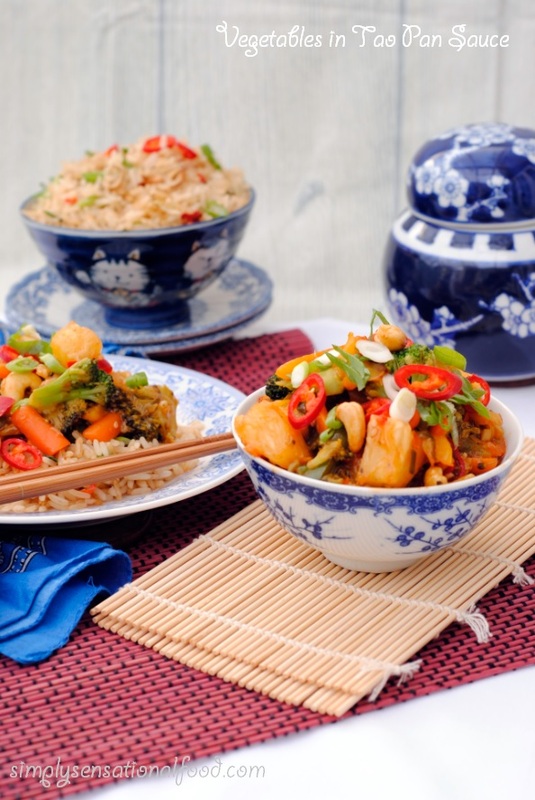 Aromatic grains of Chinese rice fragranced with sauteed garlic, scallions and a hint of chilli. 1. 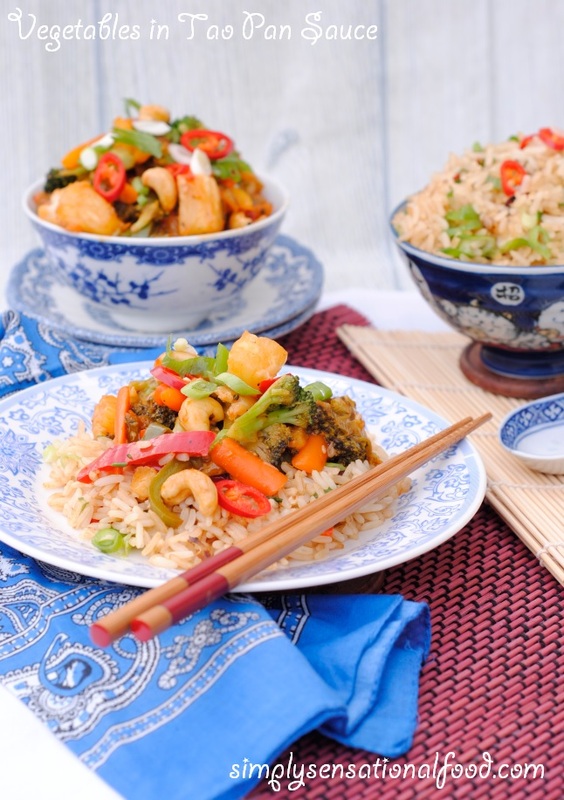 Place the Iceland Easy Steam white rice bags in the microwave for 6 minutes.2. 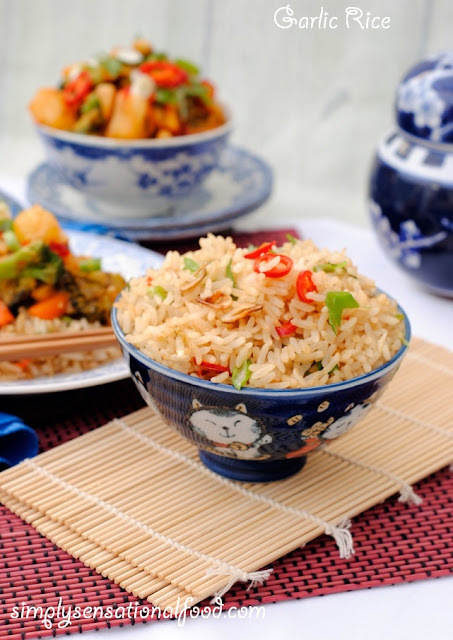 Peel the garlic and cut it into thin round slices.3.Remove the rice from the microwave and carefully cut open the bags and transfer the rice onto a plate and allow it to cool slightly.4.Add oil into a wok and allow it to heat up. Add the garlic slices and saute until they start to turn slightly brown. Remove the sauteed garlic slices from the oil onto kitchen paper.5. To the remaining oil, add the spring onions, red chilli slices, chilli flakes, salt and the rice and toss the rice. Add the soya sauce and a sprinkle of salt and then toss the rice until it is well infused with the garlic oil flavours. Add the pre sauteed garlic slices and toss them into the rice.Transfer the rice to a serving bowl. This post was in collaboration with Iceland as part of the #Powerof Frozen Campaign. To learn more about Icelands frozen foods, do visit the #Powerof Frozen website where you will find lots more recipe ideas. WOW. This looks amazing, I'd love to try this recipe out. I can't stand chilli or cooked pineapple, but the thing I love about this is that its so easy to personalise. Just chuck in whatever you like and leave out what you don't. Love this kind of recipe! Sounds wonderful! I love adding cashews to such dishes yum! What a gorgeous looking dish, and perfect for including frozen veg. I was so pleasantly surprised last time I visited Iceland, frozen curly kale... who knew!! Oh my goodness, that looks so yummy, I must have it now! I'm loving all of the veggies and the sauce sounds really good. I could go for a dish like this tonight. I have never thought of stir frying veg from frozen. That's genius and so time saving! Delicious recipe - thank you for the inspiration. Chinese dishes are always welcome for me .. such lovely and colourful veggies and fried rice served so beautifully. The garlic rice sounds fabulous, always looking for new ways to liven up simple ingredients! Yum- looks delicious. I don't always think to use frozen vegetables in my cooking, but I am trying to increase what selection I have in my freezer as it is so convenient and they don't go off like fresh!! It's because I managed without a freezer for a long time so now I have one I forget to use it! Looks wonderful Nayna, I could happily tuck into that right now. Sounds delicious! I love cashews in stirfrys! And garlic rice....yes! Oh my this looks incredible! My daughter would love me forever if I made her this! Sounds like a delicious combination of flavours. Perfect mid week supper! This looks absolutely delicious and I love the blue dishes and bowls! Oh this is making me so hungry, it's just the sort of food I love. I can quite see why this is a family favourite, it looks delicious. In fact the whole set-up looks fabulous. Cadbury's Creme Egg Eggless pancake roll Cake. Mother's Day, How was your day?